Most comfortable room and exceptional staff. Great location. Where to find Lisbon City Center hotels near an airport? How can I find hotels in different Lisbon City Center neighborhoods? Where can I find hotels in Lisbon City Center that are near tourist attractions? 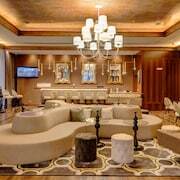 If you are choosing where to spend the night while visiting City Center, there's a broad selection of options. Our accommodation section offers 402 hotel and apartment options within a 0.1-kilometre (0.06-mile) distance of downtown City Center. Those wishing to find a hotel centrally in City Center, should check out the Four Seasons Hotel Ritz Lisbon and Tivoli Lisboa. Here at Expedia, we appreciate that all travelers have varying budgets. So if you're seeking a place to stay at the budget end of the scale, City Center offers some great options to choose from. The Residencial Florescente is 1 kilometre (1 mile) from the heart of City Center, while the Zenit Lisboa is 0.9 kilometres (0.6 miles) away. 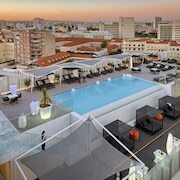 The SANA Capitol Hotel and the 4 Places - Lisbon Apartments are some other economical options that you could investigate. 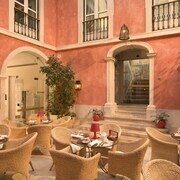 You could try the Olissippo Lapa Palace and the Bairro Alto Hotel. The Olissippo Lapa Palace is located 2 kilometres (2 miles) from the heart of City Center. The Bairro Alto Hotel, is located 2 kilometres (1 mile) away. Alternatively you could check out the rates and amenities at the Altis Belém Hotel & Spa or the The Albatroz Hotel. Once you have got a feel for City Center, why don't you travel a bit more of the region? The Lisbon and Tagus Valley area has plenty of scenic and cultural delights waiting to be explored. Investigate Lisbon and Tagus Valley's ruins, castles and traditional villages and admire the region's beaches and coastal plains. Fun-loving visitors may enjoy mountain climbing here. Looking for things to do? Why not spend some time enjoying Guincho Beach and Estoril Casino, in Cascais, 25 kilometres (15 miles) to the west of City Center. The Hotel Cascais Miragem and Pestana Cidadela Cascais - Pousada & Art District are some of the Expedia-recommended hotel alternatives in Cascais. 25 kilometres (16 miles) to the west of City Center, you'll also find Cascais Coast, which is home to the The Oitavos and Farol Hotel. The Praia do Guincho and Cresmina Beach are just a couple of the more popular places to explore in Cascais Coast. Situated 5 kilometres (3 miles) from City Center is Portela Airport. 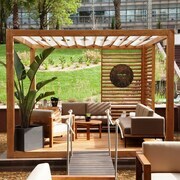 Stay nearby at Myriad by SANA Hotels or EPIC SANA Lisboa Hotel. 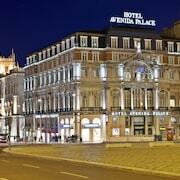 What are the most popular Lisbon City Center hotels? 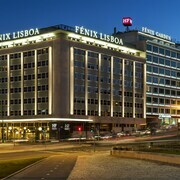 Are there hotels in other cities near Lisbon City Center? 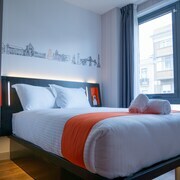 What other types of accommodations are available in Lisbon City Center? Explore Lisbon City Center with Expedia.ca’s Travel Guides to find the best flights, cars, holiday packages and more!